NOTE TO READERS: This issue is a reconsideration of the previous issue. The intent is to focus on the mimetic analysis of religious violence, independently of other theological or pastoral considerations. It is reiterated that this analysis in no way implies intentional wrongdoing by any person at the Vatican or elsewhere. That the exclusion of women from roles of religious authority is a theological absurdity is well documented . Not so the fact that such exclusion is an act of violence that used to be rationalized by the presumed inferiority of women relative to men; and now is perpetuated by blaming God for a prohibition that is entirely manufactured by human hands. This issue is focused on one such act of violence: the ban on women priests in the Roman Catholic Church. The reader should have no difficulty in thinking about similar cases in other religious traditions. The Girardian method of mimetic analysis  is used to show that God is being used as the scapegoat to justify the violent act of reserving priestly ordination to men alone. In the case at hand, there can be no doubt that God is innocent. Does it follow that the Vatican is guilty? The answer is yes if by "Vatican" we mean "the Vatican as a patriarchal system." The answer is no if we try to assign guilt to one or more of the Vatican officials involved in this sad episode. One reason is, of course, that only God can judge. In terms of mimetic analysis, another reason is that the aformentioned Vatican officials were acting under the contagious influence of the patriarchal mindset. The real culprit is the phenomenon of patriarchal contagion. Perhaps these officials thought that they knew what they were doing, but the weight of large and old institutions, such as the Roman Catholic Church, is just too much for anyone on the inside to remain free of patriarchal contagion. Therefore, as Girard suggests, it is always wise to remember the words of Jesus on the cross: "Father, forgive them, for they know not what they do." . In addition to the Abrahamic religions (Judaism, Christianity, Islam), other patriarchally organized religions suffer from the use of violence, usually manifested as some form of exclusion based on gender, race, or some other human differentiation. Religious violence is generally sustained by some mix of the triple addictions to wealth accumulation, absolute power, and worldly honors. Most of the Eastern religions are also very patriarchal, including the Hindu and Sikh traditions in India, Buddhism in Southeast Asia, Confucianism and Taoism in China, and Shinto in Japan. But it is noteworthy that the ancient origins of some of these Eastern religions was not patriarchal, and included both masculine and feminine images of God. Some of them also had a nosexist ethos. Nevertheless, most of them degenerated into patriarchal religions as they became institutionalized over the centuries. It cannot be overstressed that religion is not the culprit; patriarchy is the culprit. Religion (spirituality might be a better term) is the indispensable expression of the human need to relate to God -- under one name or another. But religious patriarchy has nothing to do with God's will or the integral development of human beings. As a matter of fact, patriarchal behavior is against the divine plan for humanity and constitutes an enormous obstacle to human development. Violence is always against the divine plan for humanity; Jesus is the model who always answers violence with nonviolence . Blaming God for religious violence is always a lie that consumes energy and other resources at the expense of authentic human development . All patriarchal religions find the need to offer sacrifice, and the sacrificial victim can be an animal or a human being. This pattern is both confirmed and reversed in the Christian gospels: the historical Jesus, who was crucified near Jerusalem at the beginning of the Common Era, was (and is) both human and divine. 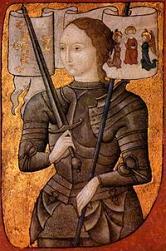 Regretfully, the Christian churches have indulged in sacrificing human scapegoats many times, a well known example being that of Joan of Arch (burned at the stake in Rouen, France, 1431, when she was 19 years old, for the "heresy" of leading a secular military campaign against the British occupation of Northern France). This may be an extreme example, but it shows how much a patriarchally distorted religion can influence culture and social practices. Christ is blamed for not giving his authorization to ordain women. 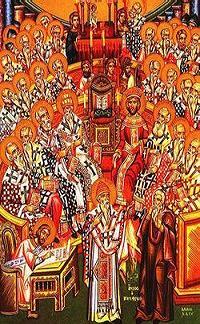 Those who reject the "unanimity" of agreement with Ordinatio Sacerdotalis are blamed for breaking church "unity." 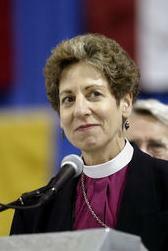 The Anglican Communion is blamed for inciting "disorder" by ordaining women. Scapegoating Christ is like using artificial birth control to prevent (perhaps even abort?) female priestly vocations. Scapegoating loyal dissent attempts to coerce people to "self-expel" themselves from the Church-Body of Christ. Scapegoating the Anglican Communion means that protecting the Vatican's absolute power is more important than Christian unity. The notion that this is what God wants is absurd. God always wants what is good for people. Else, the mysteries of the incarnation and the redemption become myths that require the murder or expulsion of a guilty scapegoat. And if this is the case, then the entire corpus of Judeo-Christian scriptures becomes nonsense . The mimetic analysis of religious violence sets the stage for our second iteration through the patriarchy-solidarity-sustainability feedback loop . Violence is the common denominator that prevents progress toward a world of human solidarity and ecological sustainability. In particular, violence is the common denominator for most obstacles that prevent further advances in human development. And, much of the violence in society is triggered -- directly or indirectly -- by religious violence, especially patriarchal religious violence. In other words, more religious violence leads to more social violence, and more social violence leads to disruptions of human solidarity and ecological sustainability. Figure 1 shows plots of the Human Development Index (HDI), Gender Development Index (GDI), Life Expentancy Index LEI), Education Index EDUI), and GDP Index (GDPI). The data source is the latest United Nations Human Development Report . The graph shows the HDI and other indicators for 177 countries, with the countries ordered by increasing value of the HDI. "God of love and peace, we confess as Christians that we are heirs to a long heritage of prejudice and violence. Guide us to a place where we may gain the wisdom to resist all beliefs and actions that harm others. Make us into a people who understand your love as illustrated in Christ’s suffering. Keep us from crucifying others in the name of the crucified Christ. Amen." Satan is no longer in control. The acceptability of violence is decreasing. Concern for the victims of violence is increasing. What is the next step going forward? See Part Three of I see Satan Fall Like Lightning, Rene Girard, Orbis Books, 1999. "Think globally. Act locally." Enjoy the Summer. Should Women be Priests, R. W. Howard, Basil Blackwell, Oxford, 1949. 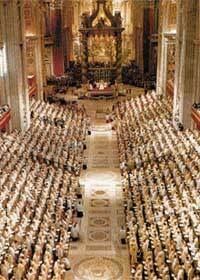 The ordination of women in the Roman Catholic Church, John Wijngaards et al., 1996-2006 This monumental web site is a treasure of relevant texts and other resources. Can Women be Priests?, Pontifical Biblical Commission, June 1976. Tradition and the Ordination of women, Catholic Theological Society of America, 1997. Fallibly Infallible? A New Form of Papal Teaching, Hermann J. Pottmeyer, America, 3 April 1999. A Priest Called Ludmila, Christa Pongratz-Lippitt, The Tablet, 2001. Inter Insigniores: On the question of admission of women to the ministerial priesthood, Sacred Congregation for the Doctrine of the Faith , 15 October 1976. Apostolic Letter Ordinatio Sacerdotalis: on Reserving Priestly Ordination to Men Alone , Pope John Paul II, 22 May 1994. Responsum ad Dubium, Concerning the Teaching Contained in Ordinatio Sacerdotalis, Sacred Congregation for the Doctrine of the Faith, 28 October 1995. Apostolic Letter Motu Propio Ad Tuendam Fidem: by which certain norms are inserted into the Code of Canon Law and into the Code of Canons of the Eastern Churches, Pope John Paul II, 18 May 1998. Colloquium on Violence and Religion (COVR), Official website for exploration, criticism, and development of René Girard‘s Mimetic Theory. Last updated 22 June 2006. This site includes a list of Girard's publications, a list of publications about Girard's work, links to Girardian material available online, the COVR bulletin, and other Girardian resources. Girardian Reflections on the Lectionary: Understanding the Bible Anew Through the Mimetic Theory of René Girard, last revised 6 May 2006. Violence Unveiled: Humanity at the Crossroads, Gil Bailie, Crossroads, 1995. Violence and the Kingdom of God: Introducing the Anthropology of René Girard, Abbot Andrew Marr, based on an article published in the Fall 1998 issue of the Anglican Theological Review under the title of Violence and the Kingdom of God. René Girard’s Contribution to the Church of the 21st Century, Gil Bailie. Published in Communio: International Catholic Review, Vol. XXVI, No. 1, Spring 1999. What is Paul actually inviting the Corinthians to do?, Pauline Guthrie, Theology@McAuley, Australian Catholic University, February 2003. My Core Convictions: Nonviolence and the Christian Faith, Paul Nuechterlein, last updated 2 February 2005. Violence and the Sacred Victim Vindicated, Abbot Andrew Marr. Last updated 4 March 2005. 'Let the Word alone do the Work': Mimetic Theory Goes to Church, Rev. Stephanie Perdew, Senior Pastor, and Mrs. Suzanne Ross, Director of Christian Education, United Church of Christ, Wilmette, Illinois, USA. Colloquium on Violence and Religion (COV& R), Koblenz (Schöenstatt) Germany, July 2005. The Cornerstone Forum: Exploring Faith and Engaging Culture, Gil Bailie. Last updated 14 June 2006. James Alison Theology Webpage, James Alison, last updated 2 June 2006. How faith turns violent ~ We have begun to understand the ways violence and religion are linked; now we must learn to break those links, Vern Neufeld Redekop, Ottawa Citizen, 22 May 2006 . Isaiah 1:11-17, Jeremiah 7:22-23, Hosea 6:6, Amos 5:21-24, Micah 6:1-4 and 6-8, Matthew 9:13, Matthew 12:7. Luke 24:34. For Girard's mimetic analysis of the Passion, see his article Are the Gospels Mythical?, First Things, 62, April 1996, pages 27-31, as well as his books The Scapegoat, John Hopkins University Press, 1986, chapters 8 to 12, and I See Satan Fall Like Lightning, Orbis Books, 1999, chapter 11. Mark 11:15-19; Matthew 5:38-42, 5:43-48, 10:21-22, 10:34-39, 26:47-54; Luke 6:27-36, 12:49-53, 22:35-38, 22:47-51; John 18:36. The Koran and Muslims: Intellectual stagnation in the Muslim world long preceded revivalism and its hideous offshoot, fundamentalism, A. G. Noorani, Frontline, Volume 23, Issue 13, July 01-14, 2006. Ragarding God's respect for human freedom, Noorani cites the Koran: "Verily never will God change the condition of a people until they change it themselves", Koran 13:11. Interview with Matthew Fox, David Jay Brown & Rebecca McCLen Novick, Mavericks of the Mind: Conversations for the New Milennium, 1997. An Excerpt from René Girard's I See Satan Fall Like Lightning, Orbis Books, 2001, chapter twelve, "Scapegoat," pages 154-160 (the quoted paragraph is on page 157). Girard Among the Girardians, J. Bottum, First Things, 61, March 1996, 42-45. Revelation, the Religions, and Violence, Leo D. Lefebure, Orbis Books, 2000, 244 pages. For a critical and very instructive review of Girard's mimetic theory, see pages 16-23 and 29-31. Scapegoating after September 11, Eric Gans, Chronicles of Love and Resentment, No. 251: Saturday, November 24, 2001. René Girard and the Overcoming of MetaphysicsEric Gans, Chronicles of Love and Resentment No. 256: Saturday, February 9, 2002. René et moi, Eric Gans, Chronicles of Love and Resentment, No. 307: Saturday, September 25, 2004. See, for example, Revelation, the Religions, and Violence, Leo D. Lefebure, Orbis Books, 2000, 244 pages. See, for example, Genesis 1:27, 5:2; 1 Kings 19:11-12; Psalm 23; Isaiah 54:7-10; John 17:11-21; Mark 15:38, 16:9-11; 1 Corinthians 13; 1 John 4:7-8; Revelation 21:1-7. Excerpts from I See Satan Fall Like Lightning, René Girard, Orbis Books, 2001, chapter 11, The Triumph of the Cross, pages 137-153. See Figure 1 in Solidarity & Sustainability, Volume 1, Number 7, November 2005. See the United Nations Human Development Report 2005 and United Nations MDG Indicators Database. The HDR 2005 ebook is a free download, and the MDG database is free access. NEW WEBSITE: UNEP's Creative Gallery on Sustainability Communications, including a Resource Kit on Sustainable Consumption & Production. Free download of resource kits for: Advertising, Energy Savings , Eco-design, Lifestyles, Food & Hunger, Housing, Leisure, Mobility, New ICTs, Textiles, Tourism, Water. NEW BOOK: Sustainable Development for Engineers: A Handbook and Resource Guide, edited by Karel Mulder, Delft University of Technology, Greenleaf Publishing, The Netherlands, April 2006. DATABASE UPDATE: The Ecocosm Dynamics Ltd. Links Directory has been updated to include 1314 selected websites. The links are structured as a relational database. There a five columns of information for each link: discipline, sub-discipline, institutional source, content category, and website name/description. The Millennium Project of the American Council for the United Nations University is proposing the following 15 questions on the global challenges facing humanity. For more information, visit the Global Challenges Facing Humanity web page. To submit your ideas on how to answer these critical questions, send them to AC/UNU with a copy to Jerome Clayton.